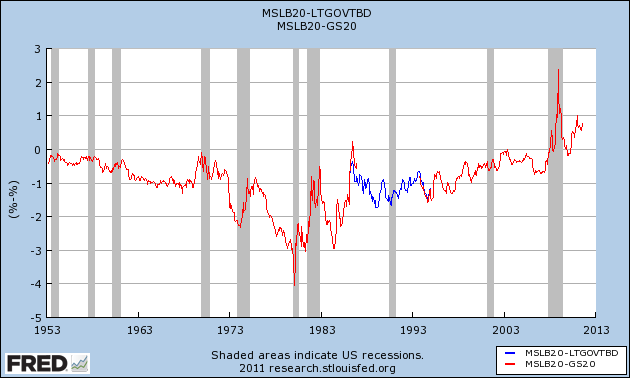 I've made no secret that I have been a heavy buyer of long-term municipal credit risk, taxable and non (via Build America Bonds) with short in treasuries of similar maturity to isolate the spread, looking for compression. But, please, take a look at the big 2008 spike. At these levels DV01s are big, so that widening can be really painful. Do yourself a favor and watch your risk levels. While there's reasons (scroll down to TOB section if you must) why I, personally, don't expect a 2008-like event, I am ready for it. This goes double if you think you are going to boost your positive carry and grab extra return from a wide discount in CEFs, as illustrated below. This is one of my favorite trades right now because I don't have a clear picture of where other things will go. 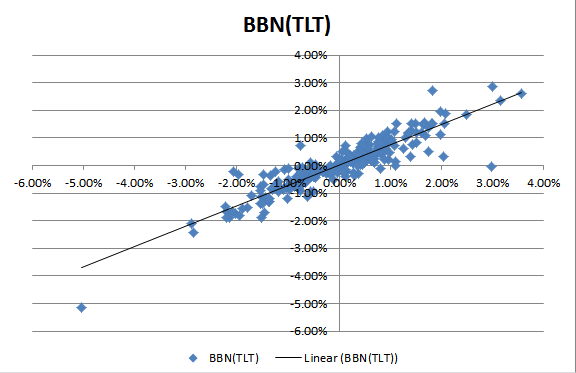 The trade is simple: Buy BBN, sell TLT. In other words, buy the discount and credit risk and hedge your duration. By my calculation, the discount at the time of this writing (intra-day) is around 10.5% and, in my opinion, spreads in the Muni and BAB spaces are relatively attractive, considering credit risk, if you're not exposed to duration. BBN is a closed-end fund that holds Build America Bonds (basically taxable munis) with high credit ratings (3.6%AAA, 69.4% AA, 35.1% A). About 57% of the bonds are callable in 5-10y, which explains why, even with leverage (~30%) the daily NAV moves of late seem small compared to treasuries. The trade carries positive (~3% including borrow). If you have size, selling the ultra bond instead of TLT is easier and cheaper, and it's what I prefer to use. 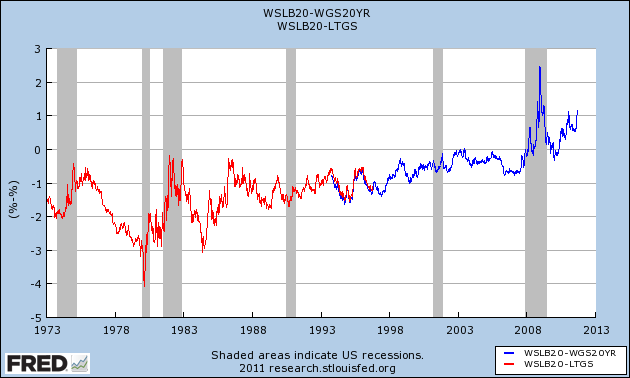 The risk with this trade is that spreads and discounts can always widen. In Nov-Dec '08 30% discounts to NAV were common and Munis took a beating vs treasuries. If you 're not levered, you can sit it out and make faces at your account balance until the dust settles. If you use too much leverage, your friendly margin clerk will probably liquidate you. Size accordingly. 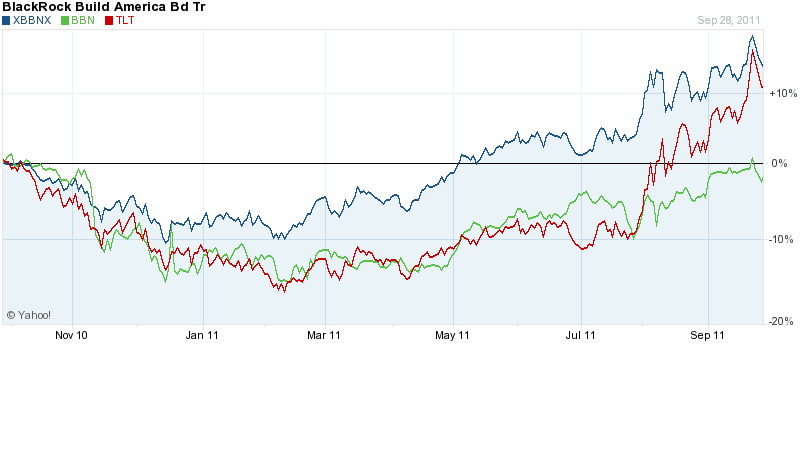 Disclosure: I am currently long BBN, short TLT and short Dec '11 CME Ultra T-Bond contracts for myself and my clients. Please remember, this is not a recommendation to buy or sell any securities. The information presented here is believed to be accurate as of the time of this writing but, hey, everyone fucks up, even me. This post is simply meant to be an illustration of one of the strategies I use in client accounts. XBBNX = BBN Net-asset value.